Dr. Chand is exceptional. She is very caring and thorough. She truly cares about her patients well-being. I highly recommendher and her team. She has practiced in the Northern Virginia and DC area for the past 6 years including an academic position as Assistant Professor at George Washington University. She is fluent in Spanish, Hindi and Urdu and welcomes patients who can speak only these languages. 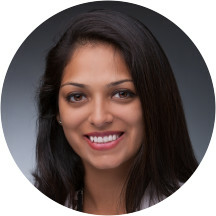 Dr. Chand was born and raised in the Washington D.C. area. She is married and has 3 children. She was straight forward, quick and listened even after waiting awhile. Hope we can get to the bottom of the problem - I have a follow up scheduled. What I liked about this office was the use of technology so ifyou did have to wait awhile, they were able to get scripts, scheduling and notes out quickly. I did not feel comfortable. Feels like she was arguing with me instead of being patient with my questions. I went to Dr. Chand for a 2nd opinion and was very glad I did. She is well informed and took the time to hear about my full history and current symptoms. She showed empathy and made sure I understood nextsteps as much as possible. The only negatives are that sometimes it is difficult to get in contact with her directly or the front desk does not always follow up in a timely fashion. Dr. Chand was 20-30 minutes late to both my appointments but I understand this happens. Overall Dr. Chand is great and I will continue with her as my new GI. Dr. Chand made me feel listened to and safe to entrust my health with her. She was incredibly thorough and made sure I knew and understood what the next steps would be. I'm glad I found Dr. Chand. She seemed genuinely concerned about my health issues and wanted to help me get better. Even though it's a little bit of a drive for me, I'm willing to ditch my current GI doctor andswitch to Dr. Chand's practice. I feel confident she will help me get better and figure out what's my problem. She was thorough, listened to me, and above all was honest with how we needed to proceed in order to make a difference and change in my life and health. I highly recommend this specialist to anyone that is ready, andwilling to make the necessary changes that she deems important in order to be happier, and healthier. Dr. Chand was professional. She listened, took the time to get a clear understanding of my issues, and made a plan going forward. She was wonderful! Late and in a rush. Dr. Chand is an established medical professional and I recommend her to all patients requiring care. Dr Chand is a great listener and does not rush you. She takes time to give you the best care. I'm glad I finally found a doctor I can trust with my health. Dr. Chand was very professional, personable, and straight-forward. She had excellent bedside manner and listened to me thoroughly. I drove out from DC to see her, and I'm glad I made the trip! Her staff is friendly and the follow-up communication was excellent. Dr. Chand is wonderful! She is the best doctor my husband and I have ever had. She goes above and beyond. She is a good listener and very knowledgeable. I will recommend her to anyone. The nicest, most professional Doctor you'll meet! She makes you feel comfortable talking about uncomfortable things. She cares about her patients and is the most thorough Doctor I've met. She will work to find out what's going on and will do everything she can to help. She took her time with me, thoroughly reviewed my history, and answered all my questions. She was excellent and I am happy to have hope that I will be feeling better soon! very good Doctor. She diagnosed me well. Dr. Chand is amazing!! She's got this friendly, casual demeanor that makes her easy to talk to and confide in. I never felt nervous or embarrassed about my symptoms or the questions being asked. She gave me a clear view ofour plan, outlining several steps ahead so I knew what to expect from my treatment. She's so knowledgeable and pleasant. I'd recommend her to anyone! Dr. Chand took the time to sit with me on my first visit (And every visit after) to really discuss what is wrong, and how best to treat symptoms as we work together (yes, I feel as if she is reallyon my side!) towards a difficult diagnosis. Her entire office staff is professional and very friendly. It was ok. Long wait. Doctor was helpful but didn't give me a positive feeling about my situation. She was a great listener, took notes, and really worked to figure things out. She did all the right tests and found answers other doctors had missed. It was obvious in my first visit that she was well educated and that I came to the right place. I truly appreciate her taking the time to understand my family history and really getting to know me. She had a great bedside manner and was a great communicator. She was easy to understand and really went above and beyond! Good Doctor. Courteous and professional. She explain everything thing I need to know about the medical issue I came in for also the next step in what I (we) need to do. Probably one of the better doctors I've ever been to. Easy to talk to and makes you feel comfortable.